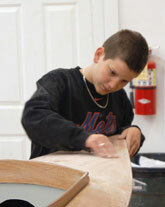 In the fall of 2004, under the leadership of trustee Gene Westhoff, Carmans River Maritime Center developed its youth kayak building program with the idea of helping young people build strong interpersonal relationships with adult partners as well as building well crafted boats for, hopefully, lifelong use. 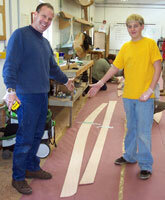 We selected Chesapeake Lightcraft's Mill Creek 13 Kayak as the design of choice both for its esthetics and because our volunteer instructors had some experience with the building process of that design. It has proven to be a good choice. We were also fortunate to be able to secure grant support which defrayed most of the material costs of the boats and enabled each student to participate in the program with just a $100. contribution. Volunteers cut out the parts for the boats prior to the start of the course and students, with their adult partners, met over a series of 13 Saturday mornings to construct their kayaks. 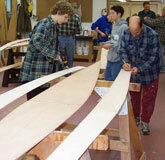 The process started with scarfing plywood pieces together to form the full length planks needed to construct the hull. On the second Saturday these pieces were stitched together with copper wire and subsequently glued with epoxy resin and fiberglass cloth. 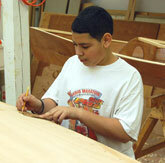 To expedite the building process, Maritime Center volunteers spent many hours during the week machine sanding and generally preparing the boats for the next step of the following Saturday's work by the students. This assistance enabled the young people to proceed relatively quickly through the construction and finishing process and by the 13th Saturday, the proud 'graduates' were able to celebrate their accomplishment and take their boats home! As word of the program's success spread throughout the community, the Maritime Center's Trustees responded by offering to repeat the course. Now, at the end of its third year, a total of forty (yes 40!) 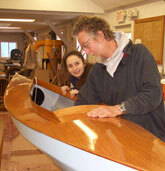 of these beautiful boats have each been constructed by a young person working with an adult partner. 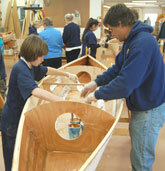 These partnerships have not only included the traditional father and son teams but also father-daughter, mother-son, grandparent-grandchild, uncle-nephew plus unrelated adult-young person teams, all of whom have build some strongly bonded relationships along with building some beautiful boats. As we seek financial resources to support additional student builders, the Trustees have established the Youth Kayak Building Fund to which individuals and businesses are encouraged to contribute so that we might be able to continue this successful program into the future.